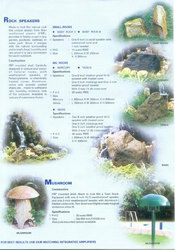 We have with us a wide range of Garden Speakers, which is specially designed in shape of different stones and rocks. These gardens speakers are easy to install, use and operate. Clients acknowledge our garden speakers for being stylish and giving loud and clear sound. DYNAMIC CONE SPEAKER 1 X 5.5"
Rock speakers are ideal for delivering high quality back ground music in Gardens and on roof top terrace gardens.These are weather proof and water resistance. Supported with well-equipped infrastructure and modern facility, we are intricate in providing wide collection of Garden Speakers to the precious clients. These speakers are broadly used for sound in gardens and many others places. Provided garden speakers are highly durable and gives optimum quality sounds to the listeners. Sensitivity: 89 db. (1 Watt 2.83v) at 1M). Compatible with Amplifiers from 10 to 100 Watts per Channel.